Jonathan Trott's decision to leave England's Ashes tour when he was fit to play was a "con", according to former captain Michael Vaughan. The 32-year-old batsman left Australia in November, with officials citing a "stress-related illness". Trott has since revealed he was "burnt out", but not depressed. "I feel a little bit conned. We were told Jonathan's problems in Australia were a stress-related illness he had suffered for years," said Vaughan. Writing in his Daily Telegraph column, the Test Match Special pundit, who captained England between 2003 and 2008, added: "We were allowed to believe he was struggling with a serious mental health issue and treated him with sensitivity and sympathy. "He was struggling for cricketing reasons and not mental - and there is a massive difference. "I have friends who have been diagnosed with depression. They have an illness that is invisible to others but can be debilitating. I do not think Trott realises just how important an issue it is." Before leaving the Ashes tour, Trott scored 19 runs in two innings during England's first Test defeat and struggled against the bowling of Mitchell Johnson. His display in Brisbane was described as "poor and weak" by Australia's David Warner, who also claimed England's batsmen had "scared eyes". England captain Alastair Cook described Warner's comments as "disrespectful", while then coach Andy Flower said they had no bearing on Trott's decision to leave. The visitors went on to suffer a 5-0 whitewash in the Ashes Test series before losing 4-1 in the one-day internationals and 3-0 in the Twenty20 series. For Vaughan, Trott's decision to walk away was the wrong one. "What Trott will have to accept is that players in his own dressing room and in the opposition will look at him and think at the toughest of times he did a runner," said Vaughan. "Trott was failing on the biggest stage and he admitted that the previous occasion he suffered burnout was in South Africa in 2009-10, the only other time he has faced top-quality fast bowling. "He was in a bad state mentally in both series but also technically. Until he corrects the faults in his game against fast bowling, he will not get any better. "He did not fight and got on a plane and went home. It is harsh but that is the reality." "It is important not to blur the line between clinical depression and concerns over the stress which is a part of your job. 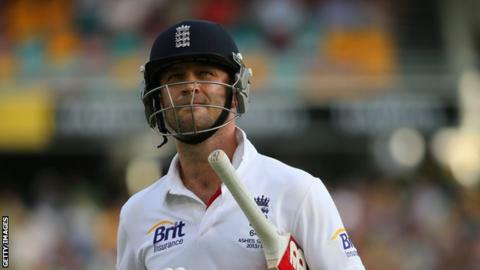 "It is difficult for everyone concerned - for Jonathan Trott and for the selectors. It is a confused picture and only Jonathan really knew how he felt when he left the Ashes tour. "He is going to have to really show that he can take the pressure again - for himself as much as anyone. "Anyone who watches Trott bat can see that it is a stressful business for him - taking guard, scratching the crease, unfastening and fastening the velcro on his pads. This has got more pronounced over time, and you could see he was getting much too fraught for his own good. "I hope he can scrap all that now, I hope we see a more relaxed character who goes about things with more freedom, and I hope he is back in the England side soon." But former New Zealand Test bowler Iain O'Brien, who suffered with anxiety issues throughout his career, completely disagreed with Vaughan's analysis. "Any GP would have given Trott three weeks off work," O'Brien told BBC Radio 5 live Drive. "It just so happens that Trott's work was so much in the public eye that he becomes judged for it. "For Michael Vaughan to use those lines and those words, it does make me feel quite ill."
Andrew Flintoff, who captained England to a 5-0 series whitewash by Australia in 2006-07, has openly discussed his struggles following that Ashes series defeat, admitting it led to him being at an all-time low. Former England players Steve Harmison and Marcus Trescothick have both said they suffered from depression and that the illness contributed to their international retirements. Matthew Hoggard, who played for England under Vaughan, backed his former captain, describing Trott's revelation as "astonishing" and "disrespectful". Meanwhile, the Professional Cricketers' Association (PCA) acknowledged Trott's condition had been exacerbated by England's congested fixture schedule. PCA chief executive Angus Porter said: "Players who are playing all three forms of the game are living a very busy, intense and unrelenting lifestyle, but in reality this is unlikely to change due to various commercial and broadcasting agreements. "We therefore need to look elsewhere for solutions. Already bowlers are rested when signs show they are on the verge of a physical problem and that logic needs to be extended. "We must also encourage people in all walks of life, not just cricket, to talk openly about mental health and ensure they receive the training, support and counselling they require, or indeed are taken out of the firing line if that is deemed necessary." Porter also defended Trott from criticism, adding: "From what I was told, Jonathan's decision to return home was the correct one, and it is wrong of people to condemn him for that decision. "We wish Jonathan well and hope he makes a quick recovery." Mark Winstanley, of mental health charity Rethink Mental Illness, said: "Whether or not Trott has a diagnosable mental health problem is beside the point, his mental health was clearly suffering at the time and if he hadn't taken action, he may well have gone on to develop more serious problems. "To admit to struggling with your mental health is not a weakness but an act of strength, which should be encouraged." Vaughan added on BBC Radio 5 live that he was sure Trott would regain his England place. He said: "I'd like to see Jonathan Trott go away and play for Warwickshire for six months, and get back that love of playing the game. "I have no question that he'll get back into an England jersey, and so he should, because he's a class player. But he should give himself that bit more time."